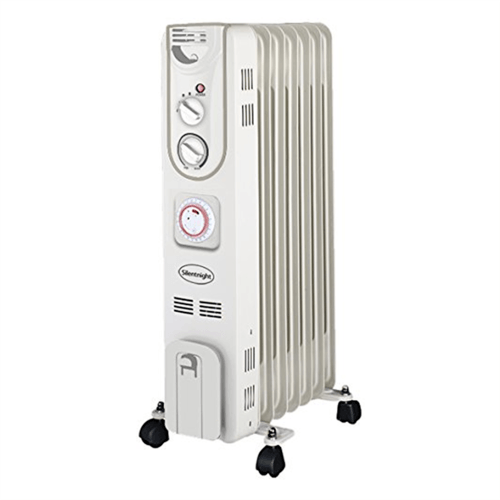 The Silent night 2kW 7 fin oil filled radiator with timer is the ideal portable heater for the coldest rooms in your home or your office. This heater, designed by silent night with bedrooms in mind, is designed to keep you warm and to operate with reduced noise enabling it to be used unobtrusively at night. The unique oil-free technology means that this product is energy saving, lightweight, and is sure to warm up very quickly. This heater comes with castor wheels which makes it very maneuverable, and able to be put away with the minimum of fuss. With adjustable temperature and a 24-hour timer, this heater can be set to heat at certain times throughout the day. with three heat settings, you can decide what level of heat you want for your home or office.